PRATO, Italy, March 17, 2009 (AFP) - Chinatown in Prato, the capital of Italy's textile industry, is bustling, apparently impervious to the global financial downturn, with warehouses full of clothes ready to ship. But an air of illegality surrounds the secretive network of clothing businesses run by Chinese immigrants, many of them operating in violation of labour laws, and their operations are tolerated less and less. "Each week we arrest an average of about 20 clandestine workers," police captain Stefano Bianchi told AFP, noting that they sleep on the premises in dormitories stacked two or three floors above the workshops. "Despite the financial crisis, they keep on arriving," he said. Cut garment pieces are usually delivered in the evening to be assembled overnight by workers who may put in shifts of between 16 and 18 hours, he said. "During a recent inspection, one company showed three employees on its payroll but there were about 20 sewing machines in the shop," said Bianchi, whose officers work in Prato's Chinatown alongside financial police, health inspectors, fire services and occupational safety inspectors. In addition to undeclared labour, the inspectors look for the inappropriate use of premises and the presence of gas canisters for cooking, an infraction of safety regulations. "The buildings are seized but the Italian owners claim to be unaware of the infractions. A few months later they are back in business," said a police officer patrolling Prato's Iolo district. Signs are in Chinese and Italian, and shutters are adorned with red ribbons in the industrial zone where dozens of textile workshops are run by Chinese entrepreneurs supplying markets in Italy and elsewhere in Europe. No laws are broken as the workers sew the coveted "Made in Italy" labels into raincoats sold wholesale for 11 euros (14 dollars) each, made with Chinese material by Chinese immigrants. Chinese textile entrepreneurs began coming to Prato in the early 1990s from the eastern Chinese province of Zhejiang. The immigrants worked first in the ready-to-wear sector, smaller than the dominant knitwear and weaving businesses, before setting up companies in the early years of this decade -- just as the sector began to suffer from the effects of globalisation. Between 2000 and 2008, the number of textile companies shrank by 37 percent, with 1,867 closures for the loss of 8,821 jobs. The current global financial crisis has exacerbated the situation by lowering demand, which has led to temporary layoffs and prompted the government to promise support measures. The Prato area now counts some 7,500 companies employing 60,000 people, with an estimated annual turnover of 4.6 billion euros in 2008, of which exports represented 2.2 billion euros. 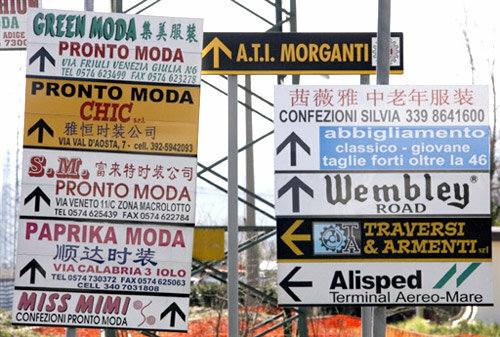 More than 3,500 of the businesses are Chinese-operated, making Prato the densest immigrant production centre in Italy. Some 70 percent specialise in low-cost ready-to-wear. "The Chinese businesses could be a boon if they followed the rules," said Riccardo Marini, head of the local employers' association. "But this unfair competition does more harm than good." By staying underground and avoiding taxes and other fees, "they avoid the worst of the crisis," he said. They send home about a euro for each of the million garments they produce each day, according to financial reporter Silvia Pieraccini of the daily Il Sole 24 Ore.
Pieraccini conducted a study of the "parallel" Chinese textile sector in Prato, which is almost impenetrable because of the secretiveness and the language barrier. The businesses spring up and disappear at a frenetic pace, being replaced at a rate of 60 percent a year -- which helps the unscrupulous to avoid detection and fines. Meanwhile the Chinese population has grown to some 23,000, according to the census, plus some 6,000 undocumented workers, according to the municipal councillor in charge of integration, Andrea Frattani.